During the final year of The Muppet Show tapings, Jim was working on both The Dark Crystal and The Great Muppet Caper along with a host of other projects. He and his daughter Lisa began discussions with Maurice Sendak about a collaboration and, on November 29, 1980, they went to Brussels to see Sendak’s first opera, Where The Wild Things Are, developed with composer Oliver Knussen. Sendak worked on other opera projects, some based on his own books and some on others’ work. 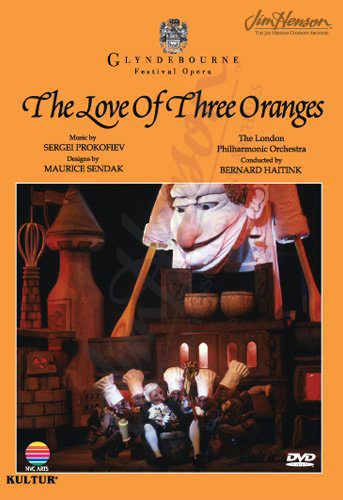 It was the Glyndebourne Festival Opera’s production of Prokofiev’s 1919 opera Love of Three Oranges that Jim attended in June 1982 with his daughter Cheryl and his Dark Crystal creative partners Brian and Wendy Froud. For Oranges, Sendak provided the set and costume designs and also illustrated a book of the same title. With Jim’s interest in the use of puppets for live theater, he would have enjoyed Sendak’s oversized character heads and fanciful sets. Learn about Jim’s first projects with Maurice Sendak. 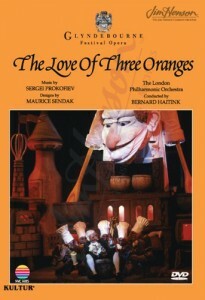 Maurice Sendak designed sets and costumed for the opera Love of Three Oranges which Jim attended. This entry was posted in 06-June '82, 1982, Social and tagged Brian Froud, Cheryl Henson, Dark Crystal, Glyndebourne Festival Opera, Lisa Henson, Maurice Sendak, Oliver Knussen, The Great Muppet Caper, The Muppet Show, Wendy Froud, Where The Wild Things Are. Bookmark the permalink.